07:30:We depart from Dublin and begin our trek towards the south- west of Ireland through the beautiful countryside. Our first stop is the 13th century King John’s Castle of county Limerick. The castle itself was built by the notorious King John, brother of famous Richard the Lionheart, and is widely regarded as one of the best-preserved Norman castles in all of Europe. The castle itself was built upon an old Viking settlement and our tour will give us insight of the medieval era of Ireland ranging from the viking invaders to the Lords of Ireland. (Entrance Fee Included) Following our visit to King John’s Castle we will drive through Lisdoonvarna the home of the oldest matchmaking festival in the world and Kilfenora home of one of Ireland’s most popular traditional Céilí bands. Following our castle visit, we will drive along the Wild Atlantic Way which is brimming with magical views, including the Aran Islands and the surfing beaches of Fanore and Galway Bay. During our coastal drive, we will take you off the beaten track and visit the famous “baby cliffs.”These hidden treasures are a pleasure and a splendid surprise for our guests. Shorter than their big cousins, the Cliffs of Moher, these smaller cliffs offer the ideal opportunity to catch a glimpse of whales and dolphins swimming off our Atlantic Coast. In addition, our stop at the baby cliffs will provide the perfect opportunity to ramble over the magical limestone landscape known as the Burren region. Dating back over 300 million years, this rugged landscape is home to over 1,100 species of plants ranging from arctic flora to mediterranean perennials and is one of the most fascinating regions of Western Europe. For lunch we will stop at the traditional village of Doolin. This village boasts some of the best traditional Irish pubs and restaurants where you can order renowned local dishes including Doolin’s famous seafood chowder, soda bread and freshly brewed Guinness. 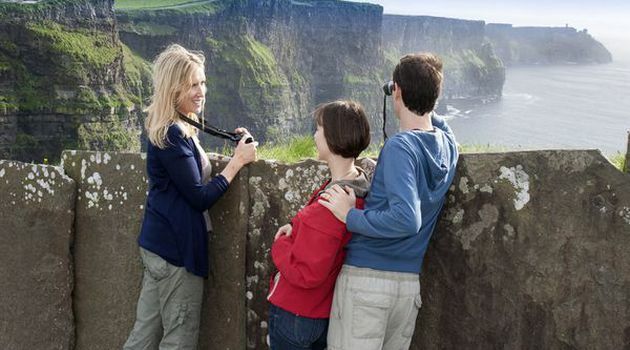 We arrive at the world famous Cliffs of Moher, one of the world's great natural attractions where you can enjoy a relaxing walk and breathtaking views. Rising 820 feet above sea- level and standing only 100 feet shorter than the Eiffel Tower, the Cliffs offer a stunning overlook of the Galway Bay, Aran Islands, and the rugged Connemara wilderness. You will also have the chance to see many of the 30,000 bird colonies nesting along the Cliffs and explore the award-winning Atlantic Edge Exhibition, free of charge of course. You will have plenty of time to enjoy all the Cliffs have to offer with this one hour and thirty minute stop – the perfect amount of time based upon years of guest feedback. On our journey back to Dublin we will take a comfort stop where you can stretch your legs or grab a snack before our final trek. On the ride back you can relax in your spacious tour vehicle (16 passengers maximum) whilst you reflect on a wonderful day in the Irish countryside. We will get you back to Dublin for approximately 19:30, with plenty of time to enjoy the evening. You can request to be dropped off either in downtown Dublin, where our driver can recommend restaurants, pubs, and entertainment for you to pursue, or we can drop you off at the same hotel you were collected from this morning.